Rotterdam is one of those European cities that leaves you with a lasting impression. It has beautiful art, majestic architecture, and rich culture in pretty much every corner. If you are looking for the best hotels in Rotterdam and where to stay, you probably already know that this city is packed with things to do and places to visit. So let’s not waste any time here and get directly to the point: where to stay in Rotterdam, the best areas and best hotels for all types of travelers and budgets. There is no single best area to stay in Rotterdam, each has its own distinct charm. The Erasmus and Willemsbrug Bridges for instance, the irreplaceable Witte Huis, or the less touristy districts that encompass a more local feel. To help you choose the perfect room in Rotterdam, we have listed some of the most popular areas of the city with the top hotels and hostels in each one. 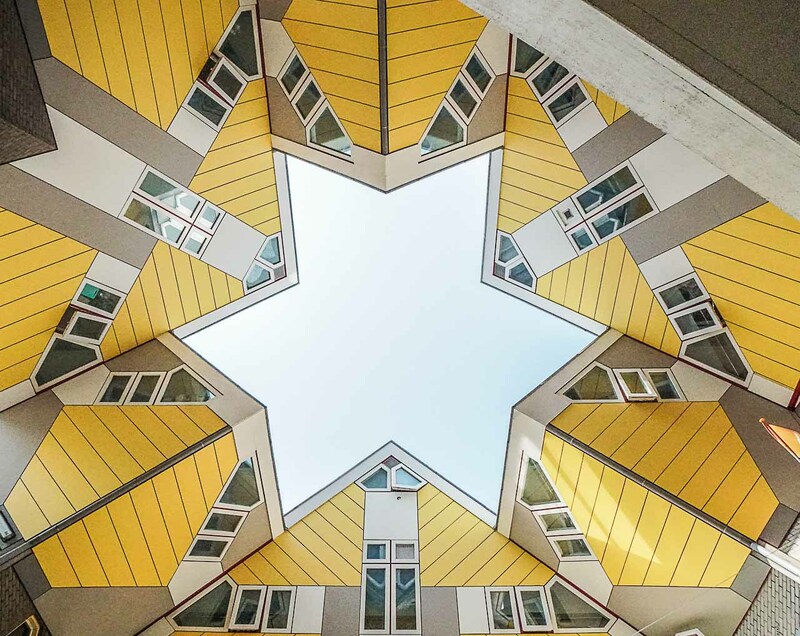 In our guide on where to stay in Rotterdam you’re gonna find options ranging from luxury hotels to budget friendly accommodation, giving you the opportunity to pick your favorite, book your trip, and start exploring this incredible city. Looking for Rotterdam travel tips? Find out what to do in Rotterdam here. Rotterdam city center has an impeccable energy, so if you book your room here you’re gonna be right in the middle of the action. This is a large area, and is divided into small districts, each one with its own peculiarities. 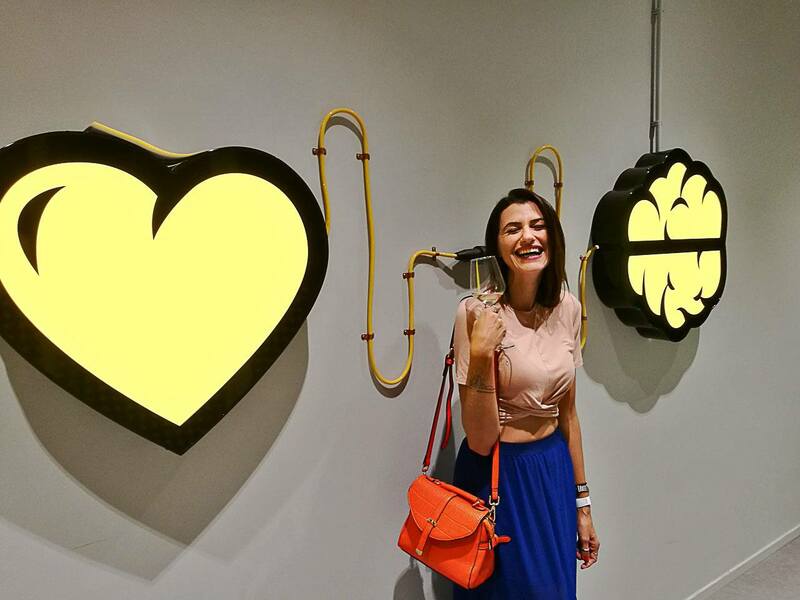 The Cool District is where the busy Witte de Withstraat Street can be found, with its bars, restaurants, galleries, and boutiques, there’s certainly enough to keep you entertained. Here you can find some of the coolest hostels, boutique hotels and international hotels in Rotterdam. Another good place to stay in Rotterdam is the Triangle area, located near Blaak Square and the Market Hall. This district is known for its amazing architecture and prime location. From here you can visit almost all of Rotterdam’s attractions on foot or by public transportation. Traveling to Rotterdam for shopping? You might want to book a hotel near Beurstraverse Street, the heart of the shopping district. Oude Haven (old port) is another popular spot where you can find plenty of cafes and restaurants, hotels, floating hotels, and floating houses. 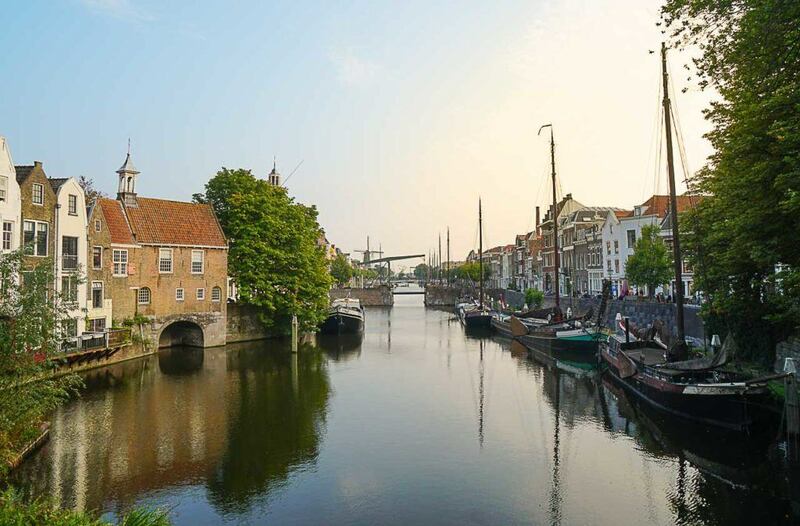 The Oude Haven is close to the Maritime Museum, Mass River and Willemsbrug, an alluring place full of history and Dutch culture. If you want to see Rotterdam ’s multicultural side, book a hotel in the Oude Western district. Still considered city center but on the western side of the Central Station. Here you will find the city’s Chinatown, some cheap accommodation and Airbnb rentals, a good option for travelers visiting Rotterdam on a budget. A luxury hotel in Rotterdam close to central station. Hilton is an elegant property; the building interior features some incredible artwork, making it a national monument. We visited the Presidential suite and it is absolutely fantastic. Check Hilton Rotterdam Hotel rooms and rates here! Marriott Hotel is considered to be one of the most high-end hotels in the city and it’s definitely one in the best hotels near Rotterdam Central Station. In fact, the rooms at the Marriott Hotel have the best views of the station and city, so if you want to admire the city’s urban skyline, this is the place to stay. The rooms are immaculate, and the service, spotless. Check Rotterdam Marriott Hotel rooms and rates here! The Holiday Inn Express is a middle range option, and is another good hotel near Rotterdam Central Station. The rooms are comfy and clean. The breakfast included in the room rate is basic but delicious. Check Holiday Inn Express Rotterdam Central Station rooms here! This modern hotel has great views and is located in the Oude Haven. CitzenM Rotterdam is the best hotel for those who want to be close to the Market Hall, Cube Houses, and Mass River. The rooms are small, but the lounge area, bar, and restaurant are beautifully decorated, perfect for travelers who want to meet friends and socialize. Check CitzenM Rotterdam rooms and rates here! Inntel Hotel Rotterdam Center has one of the best views of the city. 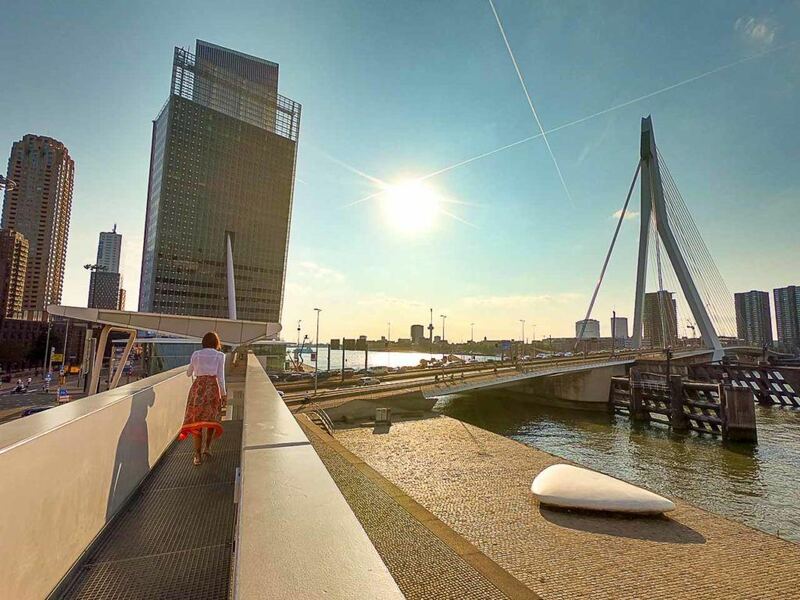 Located just beside the Leuvehaven metro station and in front of Erasmus Bridge; this hotel has the best location in Rotterdam to easily explore the city by foot or public transportation. We stayed in the Panorama Top room and loved it! The breakfast here is delicious, and the fitness center and pool area are a huge plus. Check Inntel Hotel Rotterdam Center rooms and rates here! This hotel also has an incredible location, situated on the Oude Haven, practically everything is within walking distance. It’s a great option for any traveler seeking quality service and comfort without spending too much. Check Ibis Rotterdam City Center rooms and rates here! If hostels are more your thing, or you are looking to save money on accommodation, here is our list of the best hostels in Rotterdam city center. All of the suggested hostels offer private and shared rooms, tours, tons of activities in the hostel and around the city. If you are traveling in Rotterdam on a budget these hostels might be a good fit for you. Yes, at this hostel you can sleep in a Cube House, one of Rotterdam most famous attractions. The innovative architectural project by Piet Blom is visited by hundreds of tourists every day, but only a few can actually sleep in one of the cubes. Book your room at Hostel Stayokay – Cube House here! Here location is everything and you can’t find a place in Rotterdam more central than this. King Kong Hostel is located on Witte de Withstraat Street, perfect for any traveler who wants to enjoy the nightlife while being on the doorstep of the shopping area. Book your room at King Kong Hostel here! A super cute hostel near to the Rotterdam Central Station. The house is in a quiet street close to Chinatown. However, the best part of it is the owners of the hostel, two amazing women and their gorgeous cat! Book your room at Hostel Ani & Haakien here! Located close to Erasmus Bridge and Maritime district, Hostel Room Rotterdam offers private and shared rooms, tons of tours, activities and a busy bar. We took the Street Art tour with this hostel and enjoyed it a lot. Book your room at Hostel Room Rotterdam here! Kop van Zuid is arguably the most futuristic part of the city and is where some of the best and most luxurious hotels are located. The district is filled with tall towers and skyscrapers on almost every corner. Some of the most popular architects in the world have constructed buildings here, such as Rem Koolhaas, Alvaro Siza, Francine Houben, and Norman Foster. Besides futurism, history has deep roots here. Kop van Zuid was the location from which countless people embarked on transatlantic voyages, boarding steamboats heading towards America. We stayed here on our last trip, and it is for sure one of our favorite areas to stay in Rotterdam. Hotel New York is one of Rotterdam’s most luxurious hotels. It’s a charming hotel with spacious rooms and excellent service. The hotel is located in a historical building, the former Holland America Line head office and even has direct access to a water taxi. When searching for where to stay in Rotterdam you ’ll see that Hotel New York is always among the top options in the city. I wish we could stay here forever! Nhow Hotel has a fabulous location with the best views in the city and it is one of the top places to stay in Rotterdam. Located at the De Rotterdam, an iconic three-tower building designed by Rem Koolhaas, the hotel offers luxury service, modern decor, and views that are to die for. We spent three nights at the Nhow Premium room with skyline view and loved every second. Don’t forget to order your breakfast in bed and in the evening, watch the sunset from the comfort of your own room. Check Nhow Hotel rooms and rates here! With an excellent location, Room Mate Bruno mixes cool design, comfort, and a prime location just beside the Netherlands Photo Museum. It’s a new boutique hotel in Rotterdam and there are plenty of attractions within walking distance. The price is quite good considering the location and design. Check Room Mate Bruno rooms and rates here! B&B Unitas is a very unique accommodation in Rotterdam, this boat hotel offers a warm welcoming atmosphere and good service. If you have never stayed in a boathouse or boat hotel this is a good place for your first experience. Check B&B Unitasrooms and rates here! For more floating and boat hotels read our Rotterdam by water guide! Delfshaven is one of the few districts in Rotterdam that survived the bombings during World War II. Therefore it still retains the essence of the city’s glory days. Since it’s a historic port area of the city, you can find one of the most popular ship replicas in the world – De Delft. Beer tasting is one of the best things to do at the waterfront, as well as checking out the historic spot where pilgrims gathered before sailing away on the high seas. Delfshaven is close to Rotterdam city center and you can get around using public transportation or taxi. If you are looking for a place to stay in Rotterdam that is packed with history, this is the perfect address for you. Stroom is an urban boutique hotel in Rotterdam located quite near the historic harbor, this is a neat hotel with nice eating options. The hotel is in a former electricity factory, so expect modern and out of the ordinary decor. The hotel is close to Het Park, only a 15 minutes walk, and close to tram and Water Taxi stations. Check Stroom Rotterdam Hotel rooms and rates here! This is another good option for boutique hotels in Rotterdam. It’s modern and it has one of the best locations in Delfshaven as it’s near several museums and galleries. It’s a great choice for those who want to be close to city center, but not in a really busy area. Check Hotel Light rooms and rates here! Simple yet comfortable, this is a mid-range hotel in Delfshaven. Hotel Orion has a great location for exploring the city, it’s relatively close to downtown, and only a 15 minute walk to Euromast and a 10-minute walk to Museumpark. Check Hotel Orion rooms and rates here! This district is one of the calmest and most peaceful in all of Rotterdam. However, it’s a significant tourist destination because of the exceptional Rotterdam Zoo. This is one of the oldest zoos in the Netherlands and is considered one of the top zoos in Europe. The Vroesenpark is a popular park with locals and tourists alike. If you want to stay close to the zoo and green areas, Blijdorp is the best option. If you are traveling with family and kids, this also might be a good place to stay in Rotterdam. Known for its great service, Van der Valk Hotel is located very close to the zoo. Right next door there is a fitness center which hotel guests can use for a reduced fee. This hotel is located a very short drive away from the airport, too. Check Hotel Van der Valk rooms and rates here! Located close to the Central Station, Hotel Bienvenue is only 2 km away from Rotterdam Zoo and Vroesenpark. If you are looking for clean and budget-friendly rooms in Rotterdam, this could be a good option. Breakfast is included in the room price; just pay attention when booking your room because some of them have private bathrooms and others are shared. Check Hotel Bienvenue rooms and rates here! This part of Rotterdam is considered one of the most chic areas of the city. It’s filled with gorgeous villas, elegant architecture, and romantic spots by the lake. Kralingen is also home to Erasmus University, so there are plenty of students which keep it very lively. There are many bars and restaurants, as well as an arboretum and botanic gardens. The largest park in Rotterdam is in Kralingen, the Kralingse Bos. This is a good option for people who want to be in a quiet area and close to nature. Considered to be one of the most social hotels in Rotterdam, this is a perfect choice for those who want to stay in a nice hotel without paying too much. 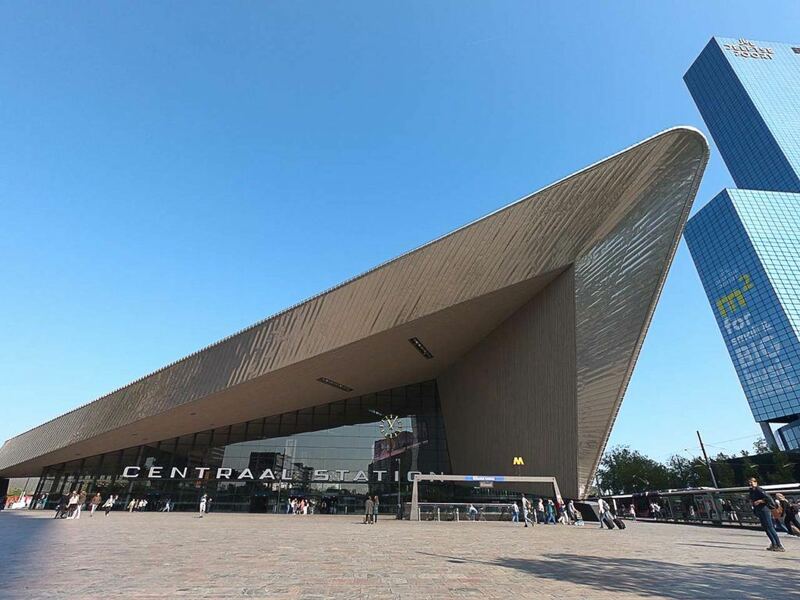 Modern and stylish, it is a bit outside of Rotterdam city center, yet it has a great location for travelers who want to explore different areas of the city, while being just one step to public transportation. All rooms come with a private bathroom and a kitchenette. Check The Student Hotel rooms and rates here! With its spacious accommodations and gorgeous views, Novotel is arguably the best hotel in the region, especially if you need a place to stay in Rotterdam which is close to Erasmus University. Novotel Brainpark has excellent service, and all the modern amenities a traveler could need. Check Novotel Rotterdam Brainpark rooms and rates here! Katendrecht is the perfect destination in Rotterdam for foodies. It’s safe to say that some of the finest restaurants and eateries can be found here. This area used to be the city’s Chinatown in years past, but now it’s a very modern and hip destination. From lobster to traditional French cuisine, everything can be found in Katendrecht, including the trending Fenix Food Factory. A historic steamship from 1958, the SS Rotterdam is now completely renovated and open to the public as a museum, hotel, and restaurant. The unique ship is full of character with excellent service. 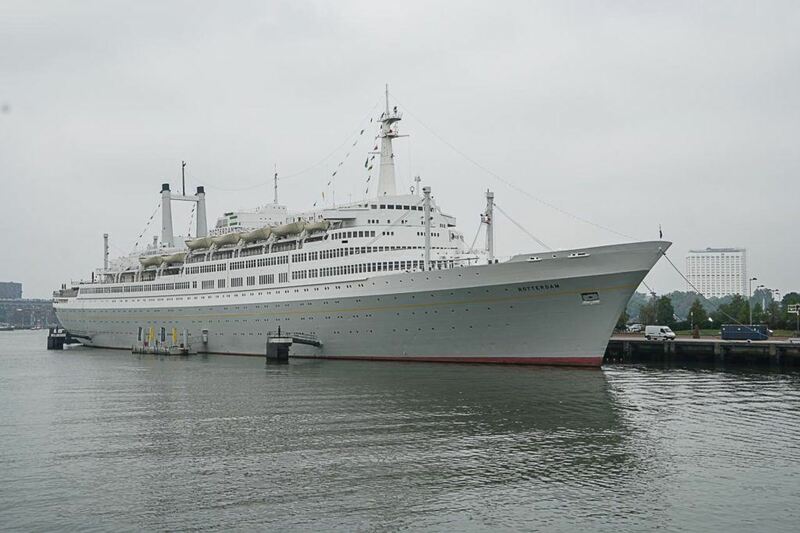 Although it’s a bit far from city center, staying at SS Rotterdam is an awesome experience in itself, as you get to sleep in one of the most iconic attractions in Rotterdam. Check SS Rotterdam Hotel rooms and rates here! This part of the city has a very unique prewar vibe. It’s one of the few areas that wasn’t destroyed in the wars, and old architecture is evident everywhere. There are plenty of almost undiscovered coffee shops and restaurants in Oude Noorden too. This charming bed and breakfast offers rooms with comfy beds and a small kitchenette. It’s a good cheap hotel in Rotterdam where you can also prepare some light meals, allowing you to save money on eating out. B&B Rotterdam Noord is located close to public transportation and is only a 10-minute walk from the Rotte River. Check B&B Rotterdam Noord rooms and rates here! It doesn’t matter where you choose to stay in Rotterdam, you should definitely venture out and explore all the districts and areas. If you only have one or two days in Rotterdam, then you should book a hotel close to the city center or to the places you want to visit most. If you are planning to stay longer, think about sleeping a couple of days in one location and then change to a different hotel or area. Love our tips about where to stay in Rotterdam? Pin it for later!